In just a few years, the portal Zoosk has positioned itself as one of the most popular dating sites in Canada. 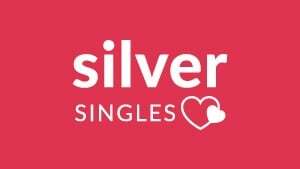 The site offers a truly unique online dating experience by combining the fun aspects of a social network with the seriousness of a matchmaking site. No endless questionnaires here, it uses its trademark feature: the Behavioral Matchmaking feature, Zoosk’s search engine that delivers you the best matches. This powerful tool is constantly analysing your actions such as the profile you visited, and then suggest you potential partners. Indeed, Zoosk believes that actions speak louder than words. The site offers a personalized dating service as it connects Canadian singles considering interests and the way they behave when interacting with other users online. Around 40 million singles over the globe have already tried its services, and its useful app has reached the first spot in the Apple App Store. If you are looking for like-minded singles near you, Zoosk has a lot to offer! What kind of information can you find in the following Zoosk Review? Getting started in Zoosk Canada: How does it work? Zoosk Search: Is it possible to find your perfect match? Zoosk app: Is it one of the best dating apps in the world? How to delete your profile in Zoosk? 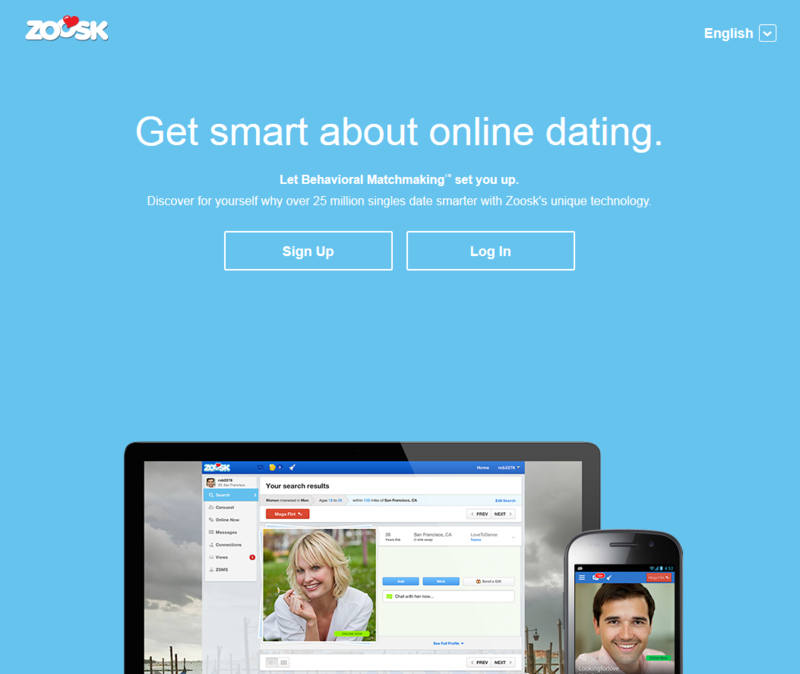 Zoosk Premium: How to cancel your subscription? Signing up in Zoosk is quick and totally free. You will asked to write your email address, select the city where you live, and tell what type of partner you want to meet in the platform: men or women. You start by creating your profile or “Date Card”. In there, you can include personal information about yourself, mention your interests and add a description, so others can know how you are, what type of relationship you are looking for, and how your desired partner would look like. There are several sections to describe yourself. You can use the features “perfect match” and “ideal date” to give other some hints about your ideal of the perfect partner. Zoosk’s story: In here you need to add some bits and bobs about you. From your hobbies to what you do for living. Make sure to include the most interesting and curious things about you to pique other singles’ curiosity. Zoosk’s perfect match: Define how your ideal mate would be. What exactly is needed to make you fall head over heels! Don’t forget to be honest and tell if you simply want to chat with other singles online or if you really have in mind to meet someone special and begin a long-term relationship. Doing so will be really helpful to filter your matches! At some levels, Zook works as social network for Canadian singles. In fact, you can import your interests from other popular social sites like Facebook. In that way, you will save some time telling other what you love to do in your spare time. Zoosk login works different from other dating sites. You can log in by adding your username and password, but also by connecting your Zoosk account to your Facebook or Google+ profile. Your data in these social networks will not be used. It simply is a mechanism to log in in Zoosk and, at the same time, verify your profile! The way that Zoosk introduces you to other singles is by taking into account the answers you give in the SmartPick survey. You can edit the answers whenever you want by going to your account settings. This is a very interactive dating site. Therefore, it is recommended to add a few nice photos in your profile in order to increase your visits and the engagement with other singles in the platform. Then, you will be given the choice to fill in Zoosk compatibility test which is made to refine the matchmaking results. Once you are done, the Behavioral Matchmaking tool will start suggesting you partners based on the profiles you have visited and the ones you have clicked on. All what has been mentioned, in Zoosk is free, but once you have been introduced to someone you would be required to pay to be able to send that person a private message. If you want to chat or even see who viewed your profile, you will also need a Premium subscription. With a Premium subscription, you will be able to meet singles in your area easily. All users can search for singles living in any city in Canada: Toronto, Calgary, Ottawa or Vancouver… but if you are seeking for potential partners taking into account your own personal criteria, and interests, then you should consider getting a paid membership. There are many ways to meet and interact with other singles in this platform. You can use, as in any other dating site, a search tool to browse for singles in your area. In fact, you are given the choice to filter your search by connected users. In that way, you can meet singles straight away, and connect at the same time by sending a wink or a chat request. However, what makes the site to stand out from its competitors it’s its unique Behavioral Matchmaking feature that connects you with other men and women taking into account the way you interact in the platform. The site offers a feature called Carousel which mainly works as Tinder’s swiping. When two uses show interest in each other, basically say “yes” when that person is introduced to them by the site, then they are able to fully view each other’s profile, and begin to communicate. SmartPick: matches personally selected for you! The tool SmartPick is similar to the Carousel. The main difference is that Zoosk’s dating experts use its very own Behavioral Matching technology to create a list of users who are complementary. Then, you have to state if you are interested in the recommended partner or not. If your answer is “yes”, and there is a positive response from the other side, then you can start talking to each other in private. Thanks to these tools you can be in touch with singles who look for the same things in a relationship, and behave the same way as you do when tries online dating. This is one of the few matchmakers that trust its users to voluntary verify their identity. One of the aspects that we believe Zoosk can improve is the lack of monitorization. The site doesn’t routinely check members using its services. However, reputation is very important in the platform. This is why users are given the chance to validate their profiles by linking them to other accounts like Twitter or Facebook. No details are published in your walls on the site’s behalf, so it really is a good way to confirm that you are genuine, and that it really is difficult to find fake profiles. When you have a trusted dating site, the next step is to launch a dating app that becomes as successful and useful as its desktop version. Becoming one of the best dating apps in the world isn’t easy. You always are competing with mobile dating giants such as Tinder. Nevertheless, Zoosk has done a great job in that field! Zoosk app isn’t just an extension of its desktop counterpart, it has its own personality. Zoosk app is currently at the first spot of the most grossing dating apps on the App store. Over 40 million singles around the globe have trusted its services, and around 3 million messages are sent on a daily basis through the app, so it is not a joke! There are several ways to start interacting with Zooskers. Singles who use the portal without a subscription, can create their profiles for free, browse for profiles and preview how the site works. Nevertheless, when it comes to contacting other singles, you would need to get a Premium membership. Zoosk Scientific Matchmaking Service™: this service suggests you one profile per day based on the information collected as well as your behavior on the site. Zoosk is linked to Facebook and if you log in via your FB account you will be able to find your friends. You can find more dating tips and advice on the Zoosk’s blog. Joining Zoosk is free! You don’t have to pay to register to the site, create your profile and use some basic features. However, to contact other users and enjoy the extra features like the option to interact in several ways with your matches, you’d need a Premium subscription. 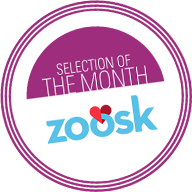 Zoosk offers different types of subscriptions to adjust to any user’s budget. Below you can find an updated table of Zoosk prices. Safety is a big priority for Zoosk. All the profiles are reviewed before they are visible on the site. Moreover, users’ information is encrypted and Zoosk guarantees not to share relevant details with a third party. The dating site offers a secure experience to the user from the moment he/she joins the site. Singles can verify their profile by recording a selfie video and submitting it to Zoosk’s team of dating experts to evaluate it. The video will not be shared to others. It simply will be used to confirm that you are who say you really are. This is a great tool to avoid fake profiles, and maintain the high quality of the platform. In the site you can find a FAQ section where you can get relevant information about how to take the best of your time in Zoosk by contacting other Canadian singles and getting a first date. There is also a guide with tips on how to online date safely and recommendations when meeting another single in person. If you prefer to talk to one of the site’s dating experts, you can contact Zoosk customer Service by filling a form. You would need to log in, and then simply add your name, email address, select the subject of your query, and add a small description. The team will reach back as soon as possible. If you want to stop using the service, you can delete your Zoosk profile by going to “Settings”, which is displayed in the drop-down menu at the top right corner. Click on the “Account Status” option, and then click on “Edit”. Next, select “Deactivate”. To completely confirm the account removal process, click on “Deactivate Zoosk Account”. Once you do so, your profile information and photos will be completely removed, and you will stop receiving notifications from the site. Before you completely delete your account in Zoosk, make sure to cancel your Premium subscription. The paid membership is renewed automatically, so to cancel it, you would need to click on “Settings”, and then go to “Subscription”. Simply click on “Cancel my Subscription” to confirm that you want to permanently stop your paid membership. Zoosk is one of the Best Dating Sites in Canada, and this is due, as we explained previously in this Zoosk Review, to its unique Behavioral Matchmaking that connects singles considering location, age, interests and surprisingly, the way they interact with others in the website. This is the reason behind not only multiple singles in Canada, but also around the globe have trusted its services. Nearly 40 million singles men and women can’t be wrong! Zoosk’s approach to dating really stands out from its competitors and the Behavioral Matchmaking technology can be considered as a major breakthrough in the industry. The emphasis is put on the social aspect of dating which makes it less stressful. Bear in mind that if you do not want your social networking life to interfere with your online dating activity you can sign up and login in Zoosk with your email address and choose not to synchronize your profile with Facebook. Zoosk Canada provides a truly unique experience of social dating. Are you ready to start finding love? What people say about Zoosk? Success stories! One of the main factors to consider when joining one dating site or another is to look at what singles who use the platform think about the services it offers. Zoosk is very professional, entertaining and reliable dating site, but what matters is how effective it is connecting singles who share the same interests and creating couples. Finding long-lasting love in Zoosk is possible, according to what users have to say. There is a section in Zoosk’s blog where you can find stories of couples who have met thanks to the dating site. Zoosk, well, in terms of what works best for them when using the site to meet a potential partner. 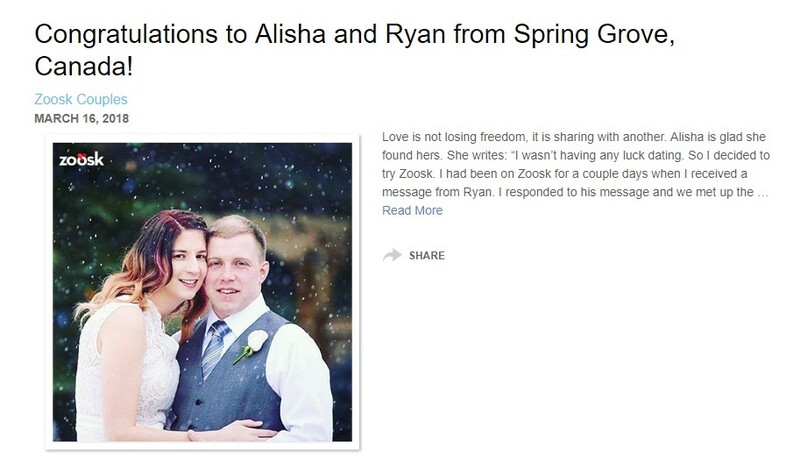 Below you can find one of the many examples of Zoosk success stories. Ready to start yours?